Automotive startup Faraday Future has just released results from its CES 2017 announcement. 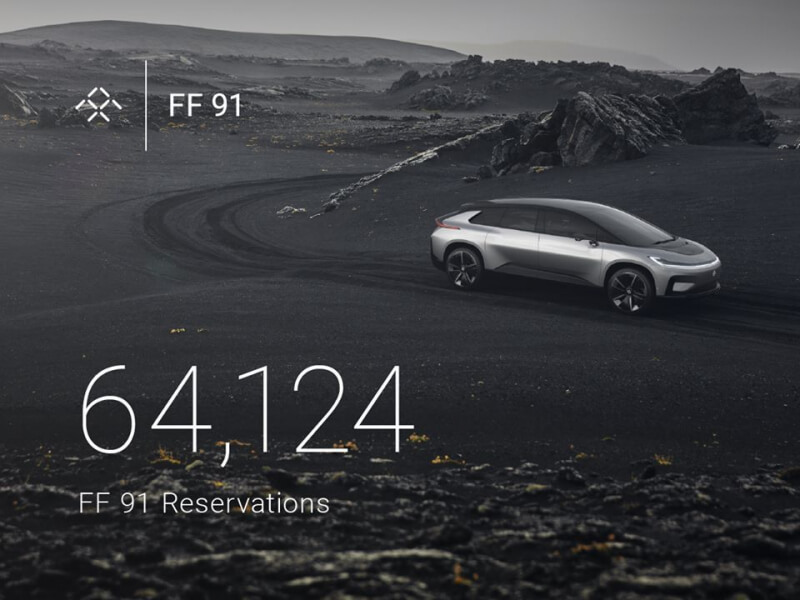 Their much anticipated FF 91 has received a total of 64,124 reservations in the first 36 hours since registration was opened. Despite their success and hype, the company has been plagued by financial and legal problems during months leading up to their big debut. They have also had top level executives and their unofficial CEO leave the company just weeks before as well. Faraday Future's CES 2017 event was largely successful with their car boasting 1,050 horsepower and a range of 378 miles on a single charge as well as a large suite of sensors and cameras. The FF 91, currently the only model they offer, is slated to begin production in 2018. The 64,000 reservations is a good sign for the company struggling to get off the ground. In context, Tesla took 520 reservations in its first week for the Model S back in 2010, but received a whopping 250,000 reservations in 36 hours for its Model 3 last year. There is no word on the breakdown of the reservations since FF offers a free standard reservation as well as a $5,000 priority reservation. It's likely most were of the free type however and this makes it hard to tell how many people are genuinely looking to buy or are just interested in the mailing list and future updates. It's clear Faraday Future is aiming to compete with Tesla's successful top-of-the-line Model S. From what we know so far, a similarly equipped Model S will cost around $100k, but many are expecting the FF 91 to come in at roughly $200k.